For many years I've had an old picture frame which was a bit tatty but which I rather liked anyway. I debated whether I would use it in the dining room as it is quite ornate and big. When I placed it on the wall above the fireplace it came all the way up to the ceiling, it was too tall. But then I noticed the feet of the frame...I could easily chop the bottom off. So that's what I did. I cut off the bottom scrolls so the mirror fit the space above the fireplace. I actually think it looks better without the bottom scrolls, much lighter and more elegant. I also cut off the back so the frame is more shallow and is more in scale with the chimney and the fireplace. My most difficult decision in this process was whether to gild the frame or leave it as it was. I did like the aged look but, although it looks quite nice in the photos, in reality it looked a bit cheap and, well, tatty. So I took out my gilding tools and gold leaf again and gilded the mirror. As you may know by now, I enjoy gilding and I love the reflective qualities of real gold leaf. 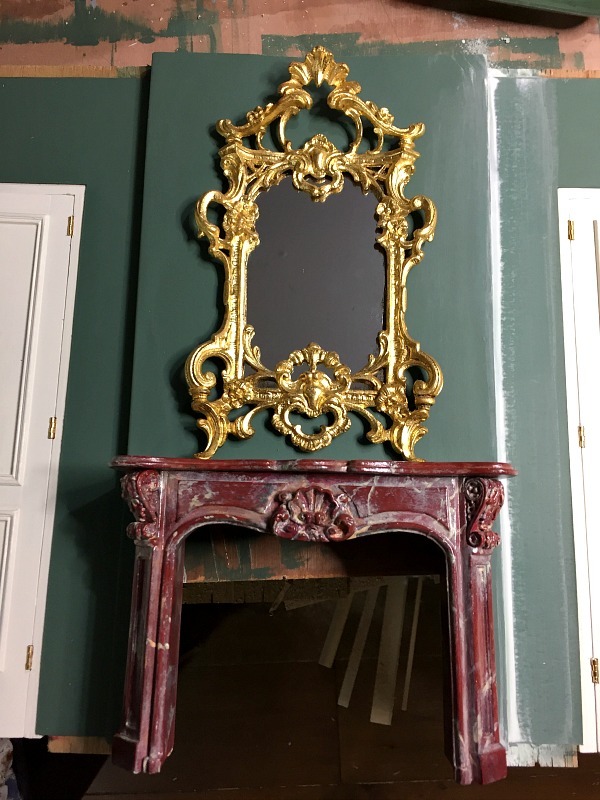 It looks very shiny and new now and I am not sure if I will leave it like this but I won't apply any aging techniques to the mirror before adding other gilded elements like sconces and wall brackets. I found a make-up mirror which was thin enough to fit inside the frame and cut it to size. I aged the edges of the mirror glass slightly, but in the end the aging is barely noticeable. For the hearth I made a black insert and a slab of marble on the floor. I made the grey marble for another project and although I didn't use it then, it was a perfect fit and colour for this project. 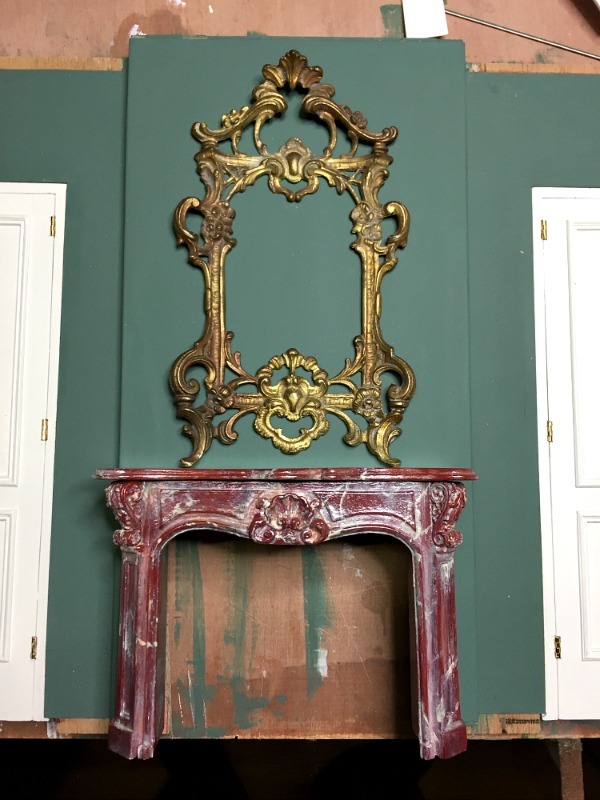 The grey colour of the marble slab is repeated in the fireplace and in the floral wallpaper. Next step is finishing the paneling and the windows. It is a gorgeous frame. Much improved I agree by cutting off that bit of scroll at the bottom. There must have been a lot of sawing to cut the back off. It looks great over your fireplace! I love finding small RL frames that can be used in miniature settings. I am not looking forward to cutting the back off the one I have, it is really thick. I did think of you when I was working on the mirror, thinking I should cast a duplicate of it. But as it is mirror with a lot of undercuts and open spaces it would be work for a professional, not me. So I will just have a unicum. 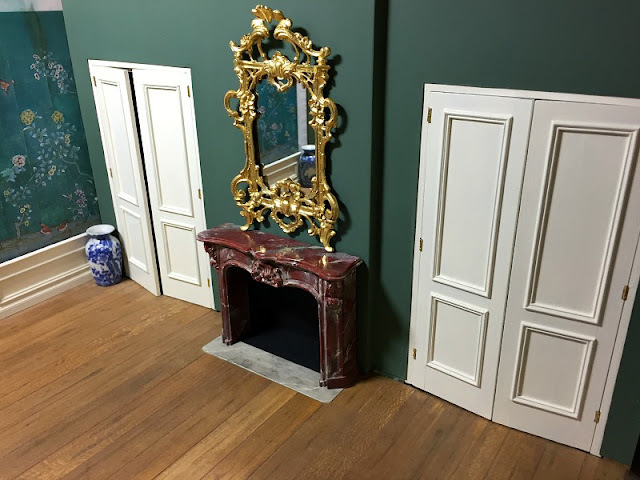 Yes those old frames are wonderful to use in miniature settings! I have no idea where mine came from, I just had it for a long time. I do look for them at auctions, flea markets etc., but they're either too expensive or too big and bulky. Haha, I would probably use paint, yes. Or maybe a darker wax or something like that. We'll see. It looks as if it were custom made just for that spot! Thank you Elizabeth. 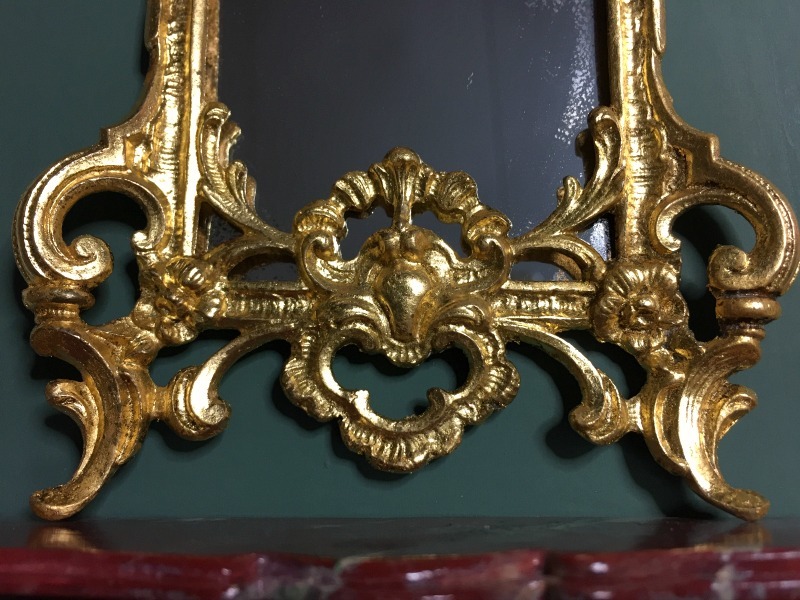 The frame probably was gilt when it started its life, there were minute traces of a gold colour to be found on it. 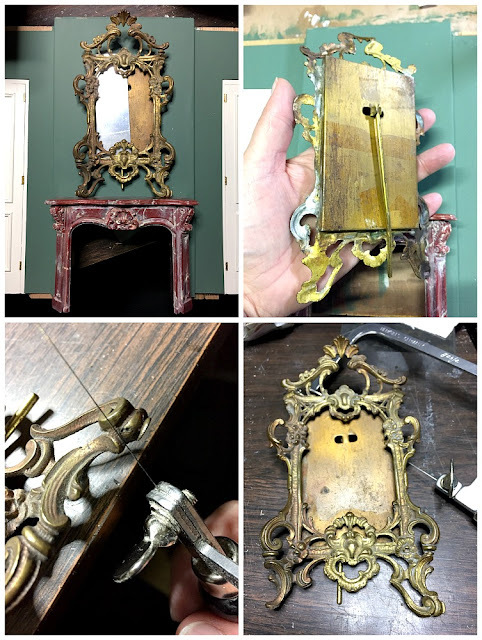 This picture frame went out to a fantastic mirror. PS Krin, plaats je weer eens iets over de Bickersgracht? Ik heb het al eerder gezegd, maar het is toch wel een van mijn favoriete huizen (nou ja grachtje dan). Dear Josje, that frame looks as though it was designed specifically for that hearth!!! The trimming of the feet make a world of difference in the overall feeling..... now it looks like it was meant to hang floating above the mantelpiece instead of standing on the surface! And as always the gilding you do is gorgeous! I am going to have to learn this process! :) (Someday!) Your eye for details is impeccable! And I always love it when something that was not "made" for miniature houses becomes the perfect adornment! You never cease to amaze and inspire me!!! Thank you Betsy! Gilding is not difficult, you just need the right materials. You can see how I do it in my videos. I actually used gold leaf on paper this time which I had never done before, it was even a bit easier to work with than the loose leaves I used previously. Thank you Alayne! Did you see the videos I made on gilding? It shows how I do it. And as I just mentioned in my reply to Betsy, I have used gold leaf on paper this time which actually was a bit easier than the loose gold leaf. Es perfecto y luce muy elegante!!! Jaaa, dit lijstje is er voor gemaakt, Josje, het past daar prachtig! Ik vond de kleur voordien ook al mooi. Maar het is zoals je zelf ook al zegt: misschien wil je de andere armaturen nog verouderen en dan kun je dit lijstje misschien niet meer aanpassen.... Deze kamer wordt weer zo ontzettend mooi. Ja ik twijfelde over het vergulden, maar op de foto lijkt de kleur mooier dan in werkelijkheid. Het was echt erg verkleurd en het zag er een beetje goedkoop uit. Het lijkt nu een beetje bling-bling ;-) maar ik denk dat wanneer alles klaar is het wel meevalt. En anders inderdaad verouderen. What a transformation. The new gilt finish is amazing and I love that you were able to alter the feet and use it...is it perfect in the space! Excellent mirror! Frame combines elegance, reliability and luxury. WOW that is a beautiful frame and looks right at home above the fireplace.